Chita - the administrative center of Zabaikalsky krai - was founded in 1653 as a silver-mining centre. The city boomed in the early 20th century as gateway to the new East Chinese Railway. Today the city is open and prosperous. Lack of tourists makes Chita a pleasant place to spend a day. Chita`s central square is nice and colorful especially in summer with blooming flower beds around a pink-granite Lenin statue. The golden domes of Chita`s recently built cathedral tower over the railway station square enticing train travelers to hop off and explore the city. The 1771 Archangel Michael log church houses a small Decembrist Museum. Those who take particular interest in the Decembrists and their women (wives and lovers) who followed their men to the long Siberian exile are advised to visit the town of Petrovsk-Zabaikalsky located in Chita oblast close to the border with Buryatia. The town features a really interesting Decembrist Museum. Another one can be found in the town of Novoselenginsk in Buryatia but it is quite a detour from the road to Chita. AMUR HIGHWAY - ТРАССА "АМУР"
In the recent past (before 2010) approximately 120 km after Chita the sealed road gave way to the dirt or gravel filled Amur highway. At least two days of bumpy ride awaited a Vladivostok bound car traveler across Zabaikalsky krai and Amurskaya oblasts. The sealed road reappeared only in the Siberian Promised Land, i.e. Jewish Autonomous oblast. Car travelers were strongly advised to have two full-size spare wheels. The Amur highway was very hard on tyres. Two flat tyres at the same time was a very common happening. Those glorious days have long been gone together with the sense of some extremality of driving by the Amur highway. In 2010 the road was finally paved but remained a bit ondulated. On seeing a sign “Uneven road”, slow down. The signs are displayed for good reason. Buddhist-minded travelers should not miss a chance to drive to the Aginsky Buryat district within Zabaikalsky krai. 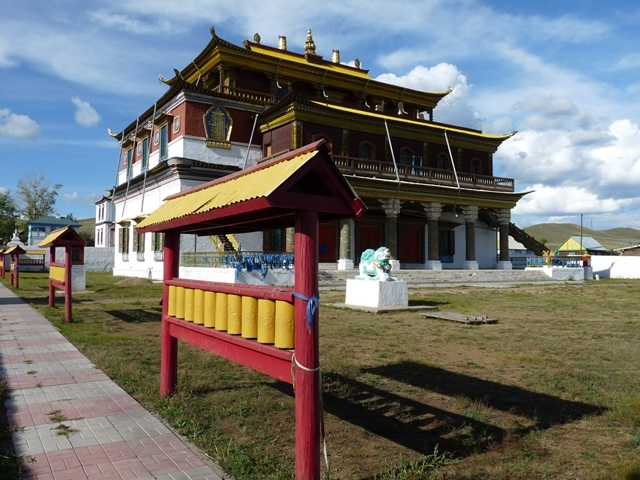 It is advisable to visit the beautiful 1811 Buddhist datsan in Aginskoe and the 1820 datsan in the village of Tsugol located about 80 km south of Aginskoe. Aginskoe despite fears of seeing a sleepy town leaves a very good impression of a very well kept place. Buddhist and christian features peacefully coexist in Aginskoe. The datsan and Buddhist academy in Aginskoe. Perhaps it is a revelation for many travelers that the most famous leader of the Mongols Genghis Khan was born on the territory of Zabaikalsky krai in 1155 (or 1162). The exact birthplace is unknown although marked on some road maps. But acoording to all sources he was born on the bank of the Onon River. The village of Tsugol mentioned above stands right on this river.